Devotees can climb 263 steps from the beach to not only venerate the image, but also enjoy the panoramic view of some of the nearby islets. 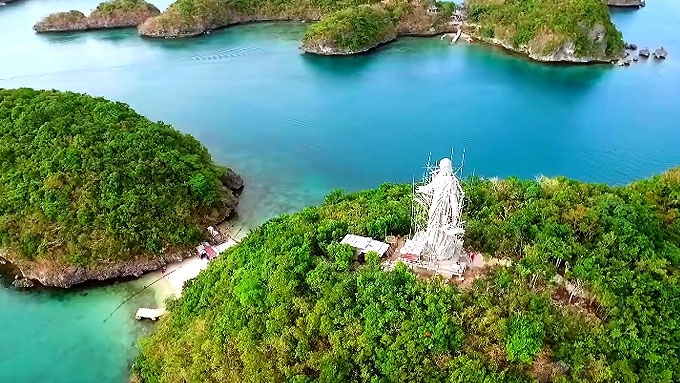 The construction of a 56-foot statue of Christ the Savior atop Pilgrimage Island (formerly Martha Island) at Hundred Islands National Park in Alaminos, Pangasinan is expected to end in the next few days in time for the observance of the Holy Week. A Facebook post by City Mayor Art F. Celeste reveals that a chapel and a retreat house will also be built beside the statue to make it a perfect site for recollections and other religious activities. The Hundred Islands National Park (HINP) has an island count of more than 120, all scattered in the Lingayen Gulf. After checking out Pilgrimage Island, you can visit Governor's Island which also has a 200-step staircase to a good vantage point; Bat Island, which has, of course, bats; Marcos' Island, which boasts a 20-foot cliff jump inside its caves; and Romulo's Island, which has a white sandy beach perfect for lazing around. How to get there: From Manila, ride a bus bound for Alaminos, Pangasinan. Travel time is three to four hours. Once you reach Alaminos, head to Lucap Terminal where you can take a tricycle to Lucap WharfÃ¢the jump-off point to HINP.